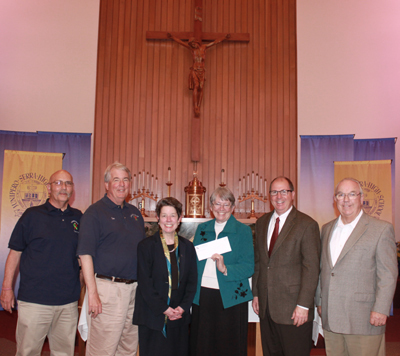 In May 2013, the YMI presented a total of $75,000 to three Catholic High Schools in San Mateo county. Specifically, the YMI gave $25,000 checks to Serra, Notre Dame and Mercy Burlingame High Schools to fund a new YMI scholarship program at each high school. For at least the next 10 years, each high school, in turn, will award a $2500 scholarship on behalf of the YMI to a deserving Junior student, who is a Catholic and whose family has a demonstrated financial need. The YMI was able to make this generous donation as a result of being a beneficiary of the Noel Miller trust. A stipulation of the trust distribution was that the funds were to be used to support youth in San Mateo County. The photo shows (from left to right) Br. George Terry - YMI Grand Director, Br. Tom Fourie - YMI Business Manager, Ms. Rita Gleasen – Notre Dame High School Principal, Sr. Catherine Doyle – Mercy High School President, Mr. Lars Lund - Serra High School President and Br. Jack Albrecht – YMI Grand Treasurer.